Jet 7 Bistro - Music and food, crazy good! You are Here >> Home >> Featured >> Jet 7 Bistro – Music and food, crazy good! The moment my wife and I stepped in, it felt like a party. Good music was already playing and an appetizer of their very own bread matched with delicious butter just kept on coming. The festive atmosphere just enveloped the entire place setting the mood for what was sure to be an amazing evening. Jet 7 Bistro, personified, is like a “bad boy” with a gentle heart, so to speak. 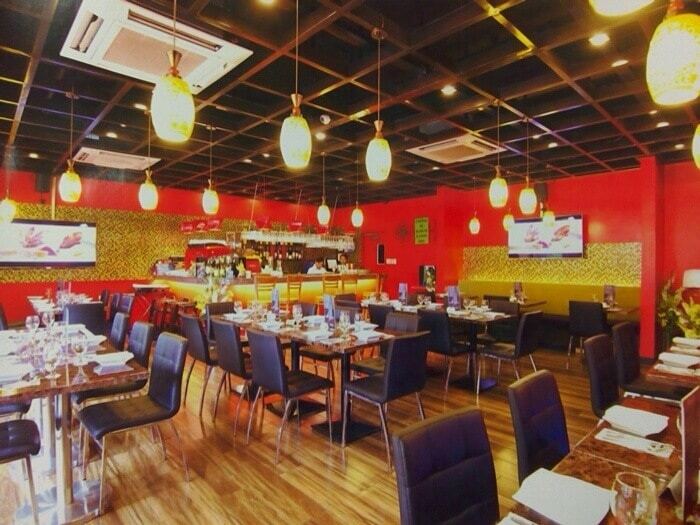 Its appearance boasts of strong red and black accents giving the place a macho-ish personality. But don’t be fooled, just like most strong personalities, there is always a soft side to it. 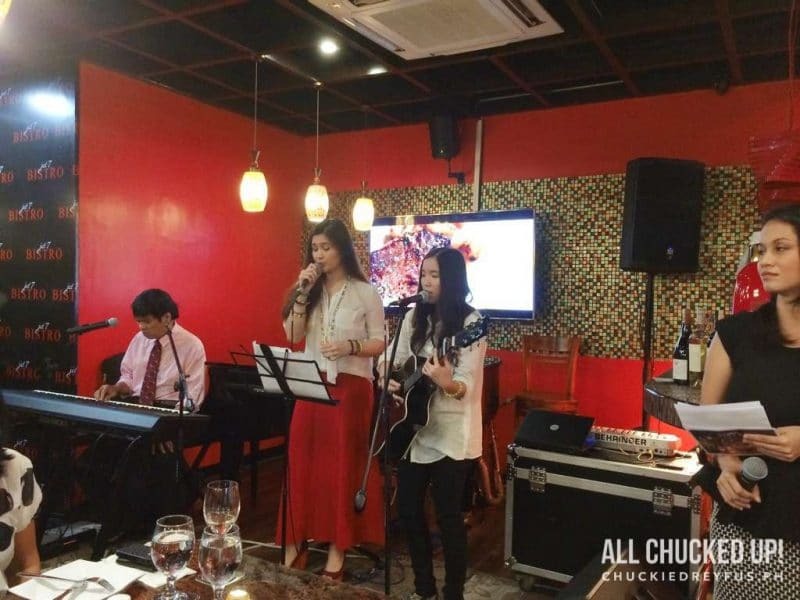 Jet 7 Bistro is homey in its own respect, offering a wide selection of music either piped-in or performed by a variety of great bands. Songs everyone can relate to and some, perhaps, we’ve grown up falling in love with – mellow, pop, rock, alternative, acoustic, laid back… spanning eras of memorable melodies and unforgettable tunes. Name it, Jet 7 Bistro’s got it. I actually met a few friends whom I didn’t even expect to see during the event as well – media people and some who were part of the band performing that evening. Happy coincidence! 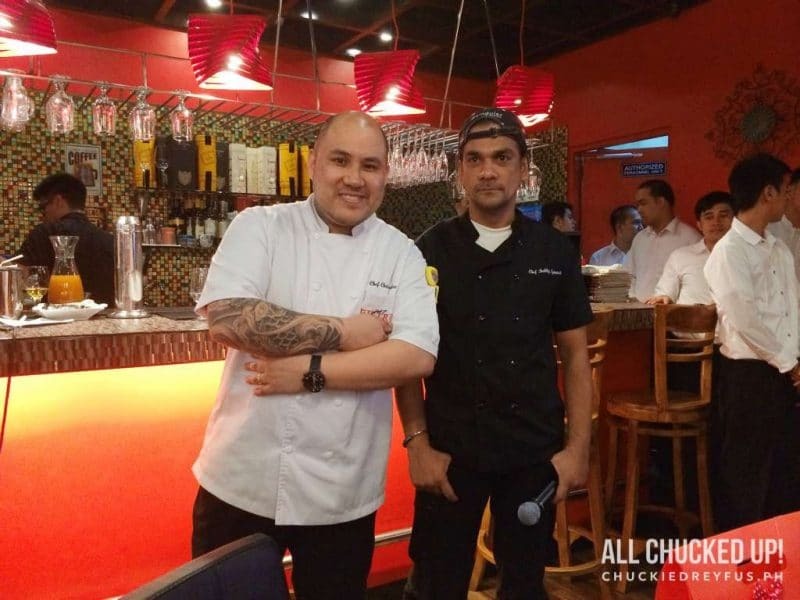 We were formally introduced to the two amazing chefs of Jet 7 Bistro – Chris Cordero and Bobby Ignacio. Both trained in the United States, these culinary wizards are always raring to provide guests and customers with dishes that’ll make each visit memorable and fulfilling. Without much further ado, a prompt introduction by the master of ceremonies kicked off one of the most awaited parts of the program, the start of dinner… And, boy, did Jet 7 Bistro not disappoint! Allow me to show you the amazing dishes that were served to us that evening. A wonderful combo of two delicious fares. Both the chicken and the beef were perfectly seasoned and cooked for a good number of hours. What you get is a dish with meat so soft and tender allowing you to slice it oh so effortlessly. Included in this dish is a generous amount of very flavorful rice pilaf and side salad. This is most definitely a Jet 7 Bistro must try. Wanna know how good this baby is? Do ya?! OMG. OMG. OMG! Does that answer your question? A wonderfully seasoned, perfectly good steak needs no gravy nor steak sauce when served. 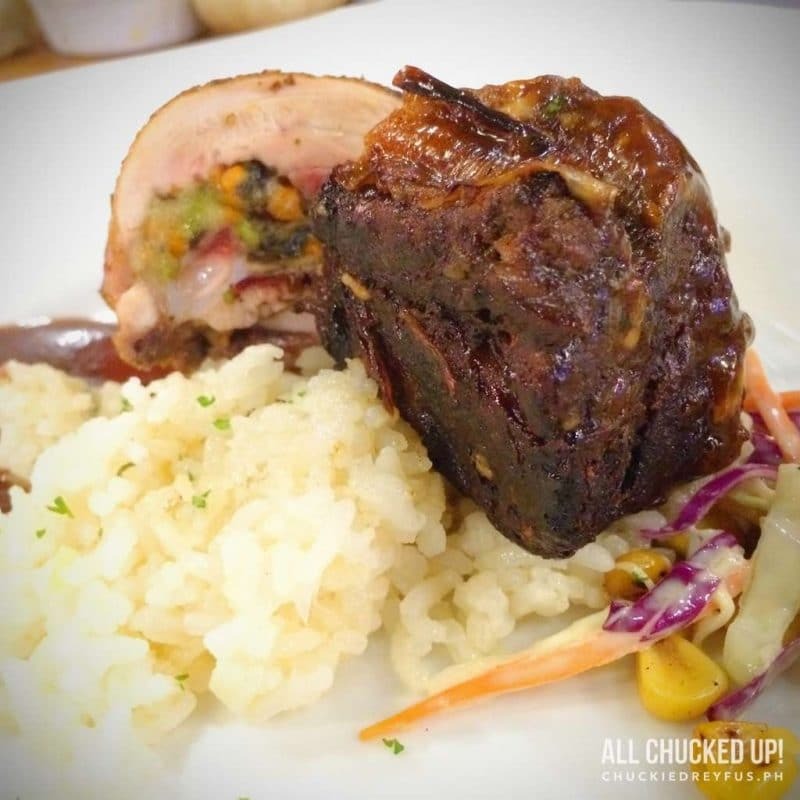 This huge slab of meaty heaven will set you back Php 3,800.00 but boy is it worth it! This gorgeous steak is already good for sharing and depending on how hungry you guys are, this Jet 7 Bistro specialty can easily (and substantially) satisfy 3-4 persons. I may not consider myself an expert on culinary dishes, but I sure know good food and great steak when I see (and taste) one. Sweet endings are always the best, don’t you think? Jet 7 Bistro seems to agree considering that they ended their impressive dinner with an equally wonderful dessert. We were each given a delectable serving of Strawberry Sabayon. 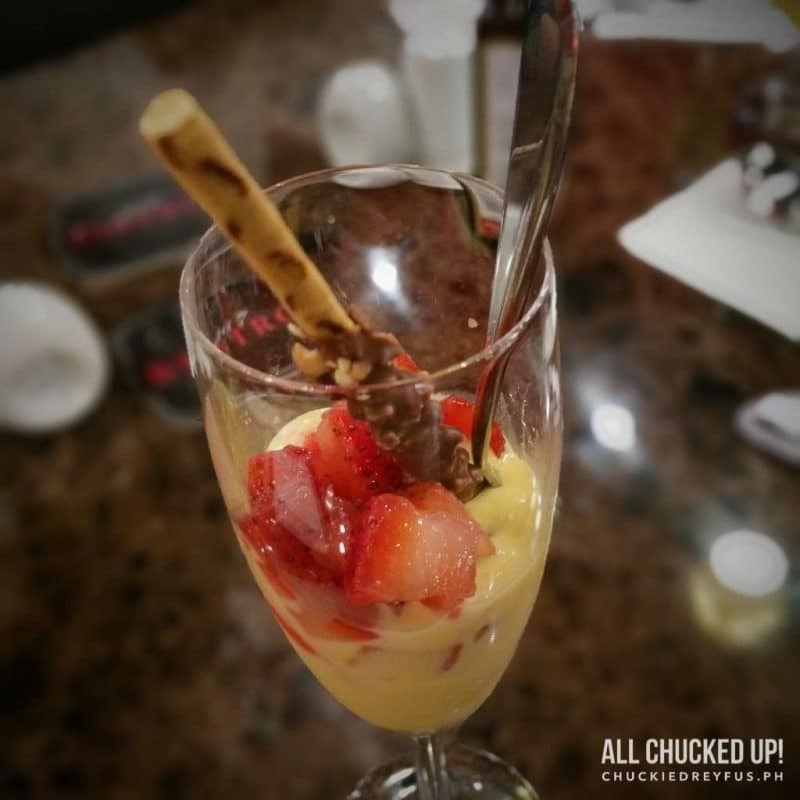 Semi-sweet creamy custard with slices of strawberry. For additional accent, a chocolate biscuit stick was included. Pretty damn good, if you ask me. 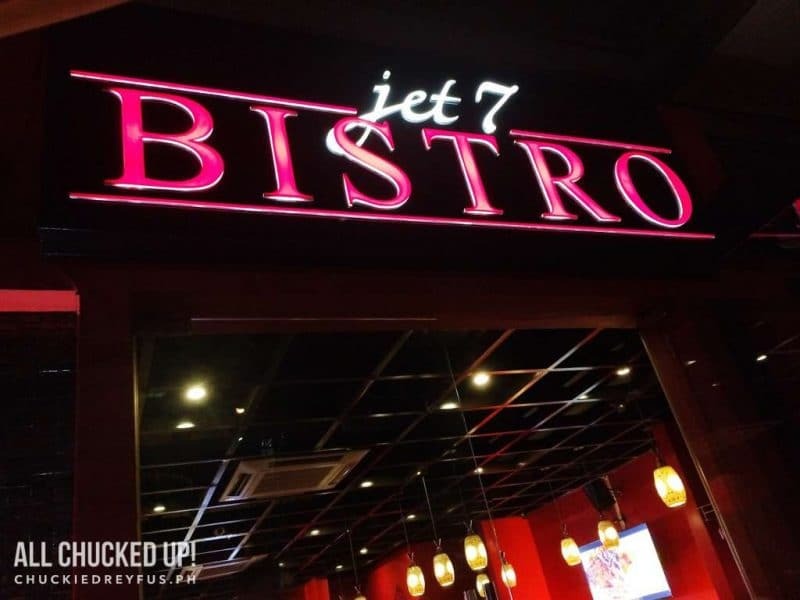 If you’re curious to know more about what dishes Jet 7 Bistro has to offer, you can check out their menu here. 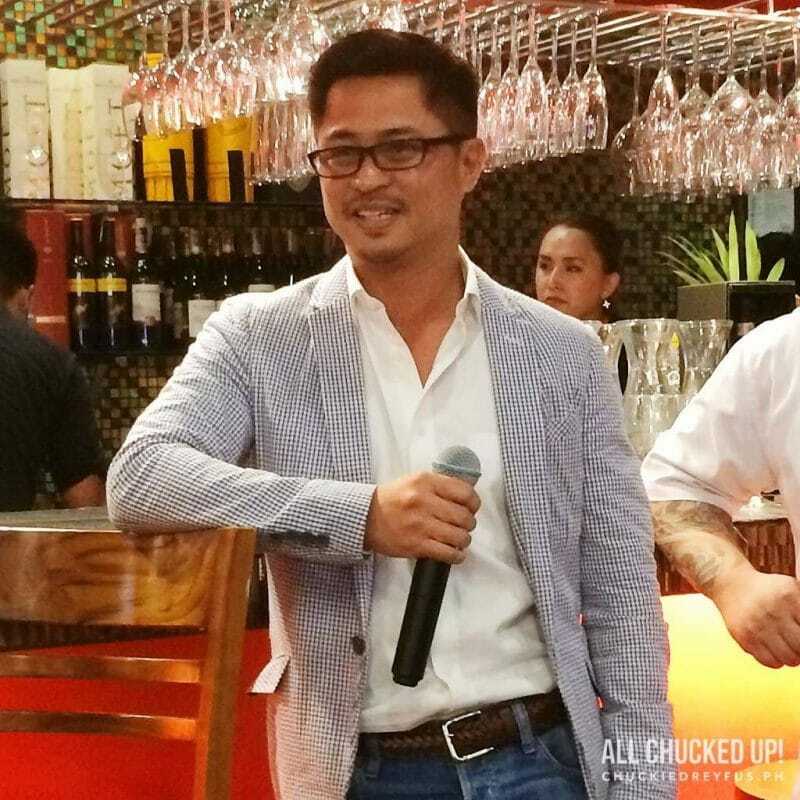 During the event, Jet 7 Bistro proudly introduced the establishment’s brand Ambassador – CEO of Beer Below Zero, International, Mr. Luigi Nuñez. 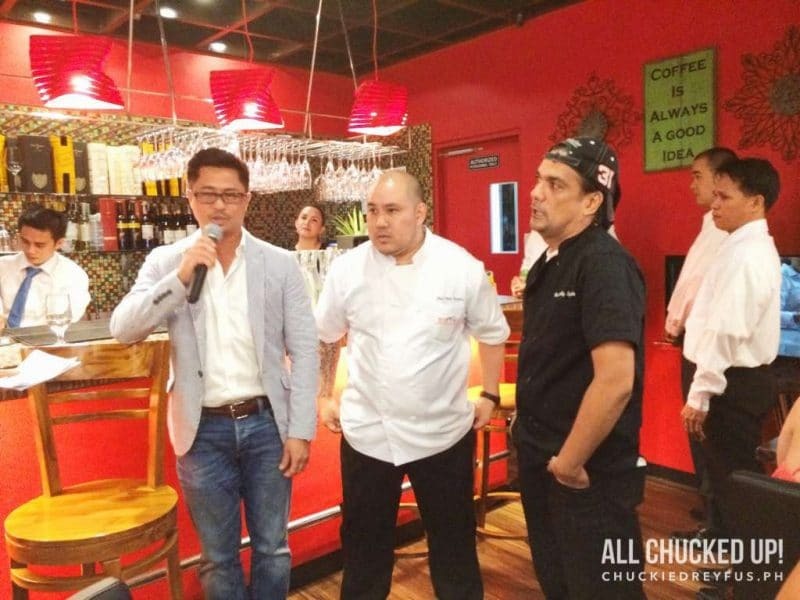 During the program, Mr. Luigi Nunez, together with chefs, Chris Cordero and Bobby Ignacio, were interviewed and even shared a few laughs with the audience. No media launch would be complete without its good share of raffle draws and giveaways to excite guests, right? And though, I’m not really known to bag anything or take home prizes during these activities, lady luck seemed to be smiling at me that evening. My name was called out and I actually did a double take not believing what I heard. 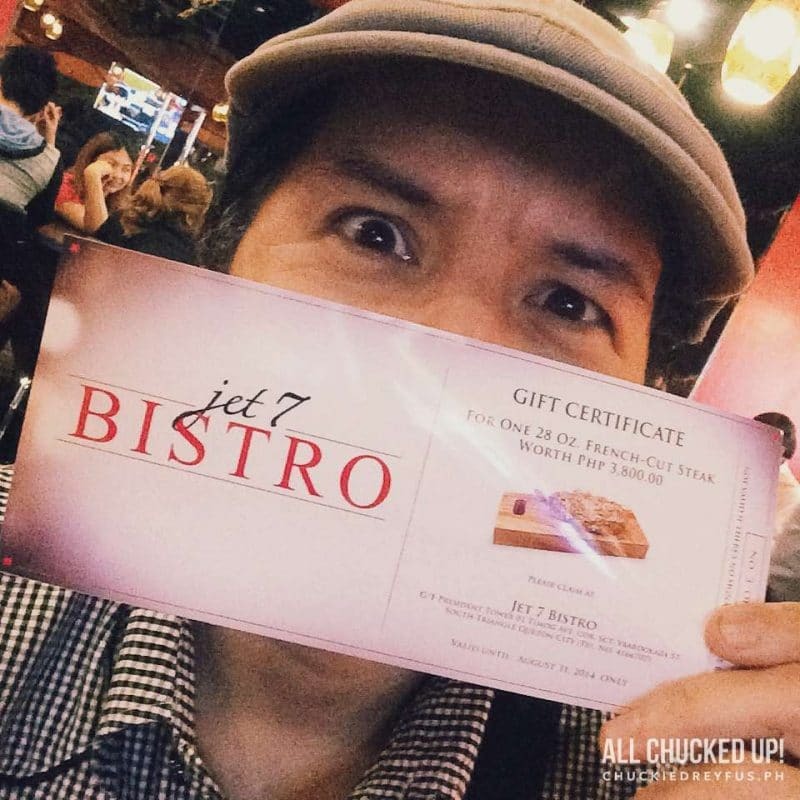 When I stood up and went up front, I found out that I won a Jet 7 Bistro gift certificate for their 28 Oz. 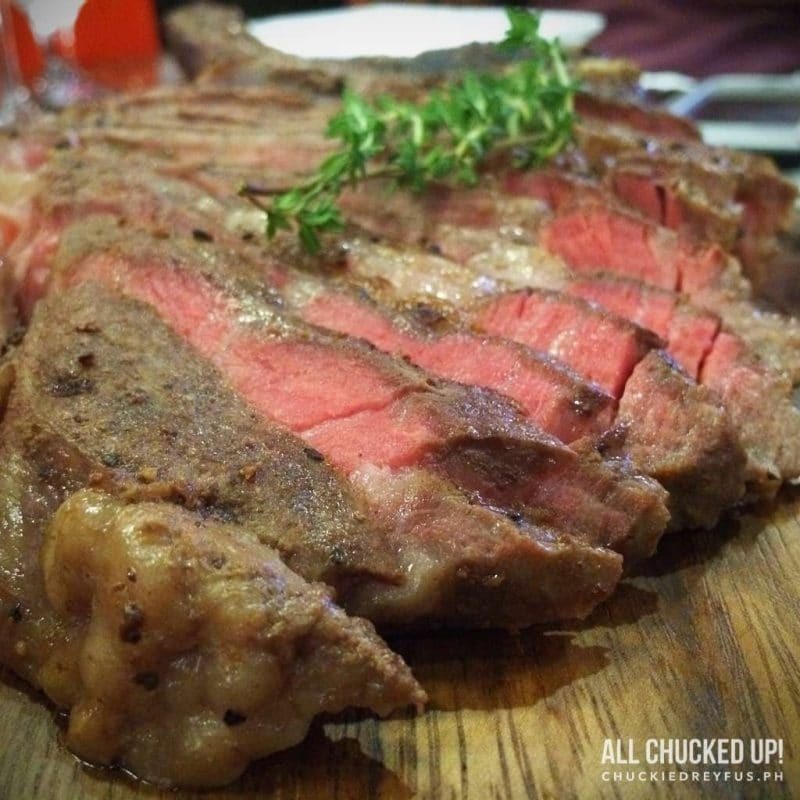 USDA French-Cut Steak worth Php 3,800.00!!! Wow! My kind of prize! Yipee! It was one absolutely fun evening. From the music, guests, activities and ultimately the amazing food… Jet 7 Bistro sure knows how to party and keep their customers happy. 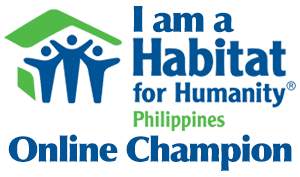 For those living down south who think that the travel to Quezon City is too tasking, fret not. I’ll let you in on a secret… Jet 7 Bistro will soon be opening a new branch over at Bonifacio Global City. 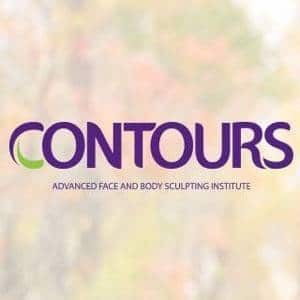 Get ready for that! I shall leave you with Jet 7 Bistro’s official AVP in case you’d like to know more about this place. Big thanks to the awesome folks of Jet 7 Bistro for being so warm and hospitable to each and every one of us. I wish you all the best! Here’s to good food, cool music and wonderful times ahead. Cheers!